Before we dive into the draft rankings, we’ll take a quick spin around the world of prospects. Eeli Tolvanen is back to being a rock star for Jokerit of the KHL. The 18-year-old winger has potted power play markers in consecutive games after going five without finding the back of the net. He’s peppered 14 shots on net in those two contests and is up to 13 goals and 23 points in just 22 contests. I cannot stress enough how ridiculous this is for a teenager playing pro hockey for the first time. He now sits 12th in league scoring and is just one point shy of tying Vladimir Tarasenko for the third most points as a U19 player in the history of the league (in 20 fewer games). Speaking of 18-year-olds tearing up top tier European leagues, Canucks’ top prospect, Elias Pettersson continues to be one of the SHL’s top players. The silky forward scored a hat trick for Växjö Thursday morning while adding two assists against Rasmus Dahlin’s Frolunda squad. Pettersson was involved in multiple more scoring chances that weren’t converted too. It was a tremendous showing. 3 goals 5 points for Elias. One of best SHL games I've ever seen from a teenager. That brings Pettersson up to 14 points in 12 SHL contests – good fifth most in the league and twice as many as any of any other U20 player. These are spectacular numbers for a draft-plus one player – something we haven’t seen since William Nylander’s 20 points in 21 games a few years ago. In Elliott Friedman’s most recent 31 Thoughts, he mentioned the potential battle that is raging between Hockey Canada and the CHL as the National team brass tries to build an Olympic roster without NHL and AHL players. One player who was specifically mentioned was Sarnia Sting forward and St Louis Blues’ prospect, Jordan Kyrou. The 35th overall selection from 2016 has taken off like a rocket since witnessing his deployment increase at the start of his draft-plus one season. His 94 points in 66 contests in 2016-17 was good for sixth best in the league and he’s off to another scorching start this year with eight goals and 22 points in just 11 games. No doubt, Sarnia is reticent to allow their best player to leave for a pre-Olympic tournament, the World Juniors AND the Olympic games in February. It’ll be an interesting situation to watch. Tyler Steenbergen and Aleksi Heponiemi continue to destroy WHL competition at a historic pace. Steenbergen is up to 21 goals and 33 points, while his pass-first winger clocks in at eight goals and 30 points. I want to say it’s crazy to think either of them can continue pushing at or near a three-point-per-game pace, seeing as we haven’t had a WHL’er break the 2.5 point-per-game mark since Ray Whitney did so back in 1990-91, and outside of Oliver Bjorkstrand in 2014-15 and Sven Baertschi in 2011-12, no WHL player has eclipsed the 2.0 point-per-game output in the last 17 years. Sticking in the WHL, Vegas’ first ever draft selection (sixth overall), Cody Glass and New York Islander’s 2016 first rounder, Keiffer Bellows are working quite well together in Portland. After struggling to find his footing with Boston University in his draft-plus one campaign, Bellows jumped ship and joined the Major Junior circuit and couldn’t have asked for a better playmaking centre to compliment his shoot-first mentality. Through the first few weeks of the season, Glass sits tied for 11th in league scoring with 21 points in 12 games while running-mate, Bellows has nine goals and 20 points. It appears the two are a match made in hockey heaven. Kole Lind is going to make Hockey Canada’s job very difficult come the holiday season. The jack-of-all trades winger has been tremendous for Kelowna to start the season, sitting ninth in league scoring with eight goals and 22 points in 12 contests after totalling 87 in 70 for the Rockets as season ago. The Canucks plucked the plucky forward with the 33rd overall pick this past June for his skill and tenacity and Team Canada may have to find room for him in their bottom six if he can keep up this pace. For those who follow my work closely, you know that a great deal of my time and energy is spent on draft-eligible players. The work that goes into formulating a draft ranking is arduous and rife with pitfalls. I rely heavily on video, speaking with scouts whom I trust and my own personal set of criteria that I use to assess talent. I had intended to wait until the new year when the World Junior Hockey Championships were all wrapped up and we had half a season’s worth of club action to dissect. However, due to some popular demand, I decided to slide this update in and give credit to some great starts by a handful of players. You’ll notice there has not been too many major shifts compared to the August rankings as this is a long game, but expect a likely overhauled list to come out in early 2018. The most impressive 16/17-year-old defense prospect to come along since Victor Hedman and he is already noticably better at the same age. Dahlin has all the tools to become a game-changing pillar for an organization. Should be ready to waltz into the league in 2018-19, but there is a small chance he spends a final season in the SHL before crossing. The hand injury will cost the dynamic winger 6-8 weeks and perhaps put the World Junior Championships into question. His goal-per-game output in the OHL was just the tip of the iceberg and no regular injury will drop him out of the top two. A legitimate 40-plus goal threat not too far down the line. Dynamic puck skills, terrific vision, speed, smarts, and a heavy shot. His late birthday means he is just a month away from being eligible for the 2019 class further illustrating how massive his potential is. If we’re nitpicking, I’d like to see him hit the net more. He’s been exactly as advertised and more for Halifax. The power winger is destroying the CHL competition as a draft-eligible and is proving to be the clear number two winger in this crop. Size, speed and skill all wrapped up. The dynamic two-way defender displayed his full arsenal of weapons at the Hlinka tournament after doing much of the same with the Spokane Chiefs a year ago. The former first overall pick in the 2015 WHL draft, Smith is an excellent skater who demonstrates poise and patience with the puck. His outlets are crisp and his head is always up. Already pacing over a point-per-game from the back-end this season. An all-around defender that teams will love. The third installment of the Tkachuk-clan may have the softest hands of them all. He’s the oldest player in this crop which lends to some more scrutiny, but his four points in six games for Boston College has been strong even though he’s yet to find the back of the net. He brings the complete package and will be a ready-made player. Wouldn’t you know it, another smaller, offensive defender comes up. Get used to it in this class. Hughes is consummate playmaker and boasts the elite speed needed to thrive at his stature. After leading the charge for the USNTDP U18 squad last year, he hasn’t missed a beat with the University of Michigan this fall recording a goal and three points in four games. He’s a dynamic player, and a good bet to not let the 5’9 frame hold him back. Owns some of the best pure puck skills in the draft. The goal scoring forward doesn’t shy away from attacking dangerous scoring areas and boasts strong speed and quick feet. He’s been on fire with the USNTDP this fall, scoring nine goals and 18 points in just 10 games. He heads to Harvard in 2018-19. The full-package of tools: Great edgework, acceleration, vision and puck-protection skills. The 17-year-old is already a consummate worker in the defensive end and is a very safe selection as he has a ton of NHL-ready tools. He lacks the dynamic offensive skills of others in front of him and his less-than-stellar start to year three in the QMJHL is a product of that. The reigning OHL Rookie of the Year, boasts elite offensive skills from the back end. Vision, passing, dynamic edges, top end speed and acceleration. His play in his own zone and decision-making without the puck is still a work in progress, but the right-handed defender has the makings of a dynamic point-producer. Will likely need more time than most around this spot. Big, strong and capable at both ends of the ice. A safe op four future with top pairing upside. Dynamic playmaking ability compliments his quick and elusive style. Another USNTDP blue liner. Owns a big shot and strong in both zones. Could work on his feet and offensive creativity. Skills for days and a package to translate it to the NHL. Watch out for Kotkaniemi, he could be driving way up this list come June. Already up to eight points in 14 Finnish Liiga contests. Slight and slippery, but knows how to find the scoring areas. On pace for a solid season with the USNTDP. 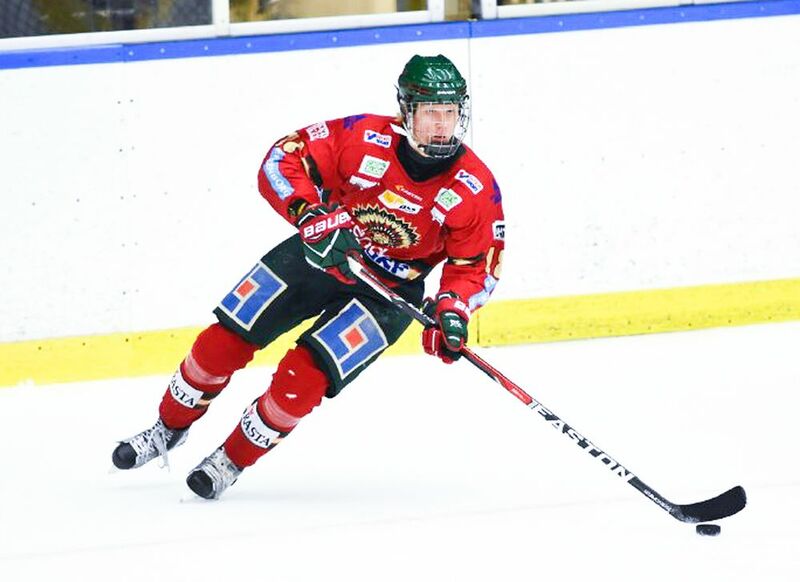 Skilled puck-distributor has shown very well as a draft-eligible player in the SHL. Responsible and heady player. A riser to watch. Calm and collected are his trademarks. Is being leaned on heavily in Moose Jaw this season and has 13 points in as many games while playing against opponents’ top lines. A buzz-saw of a player. Needs to add strength, but moves as quick with the puck as he does without. Off to a hot start with Niagara this season. Great instincts and a pro-style game. Has untapped offensive potential. Small, dynamic right-shot defender needs to thicken up and improve positioning to handle stronger players but knows how to create offense. Strong puck-moving defender has taken on bigger minutes with London this fall with Olli Juolevi and Victor Mete not returning. Has looked more than capable. Speed runs in the family. Isn’t as hard-nosed as older brother, Michael but plays a similar game. Needs to finish with more consistency but is showing flashes early on. Perhaps the most explosive skater in this class. Likely transitions to the wing where he can run a little wilder. Solid start to WHL career with Vancouver Giants. Big, power centre will be a long-term project. Likely doesn’t have the tools to be a front line offensive threat. Tier two junior competition isn’t helping his cause. He's off to Boston College for 2018-19. High-end processing skills and offensive awareness but needs to stay engaged and keep his feet moving. Red hot start to the OHL season but has cooled off since. Another riser to watch, this right-shot defender has all the tools to be an all-around top-four producer. Off to a blazing start with Acadia-Bathurst of the QMJHL. A volume shooter who protects the puck well and unleashes a heavy and accurate shot. A potential 30-goal scorer down the line. Hasn’t lit up the scoresheet like his skills suggest he should. He’s receiving more ice with Timra this season with Elias Pettersson moving up but hasn’t produced enough to warrant moving up in this class. Made a bigger impact as a D-minus one player than fellow Swiss forward, Nico Hischier did in the NLA. Nasty, heavy release and strong puck-protection skills. A bit older for the class and needs to work on acceleration. The energizer bunny is destined for a middle six-role. Speed, tenacity and great determination are his trademarks. The premier goaltender of this class has been a phenom for the Czech junior circuit for years and looked incredible in the top tier last season. An early injury has sidelined him, but he’s a legit contender to crack the top 31. If you have any questions on specific players or just want to lambaste me for having ‘Player X’ far too high, or ‘Player Y’ far too low, feel free to follow me on twitter @CrazyJoeDavola3 where I’m often giving unsolicited fantasy advice that I’m sure at least someone is listening to.